Boats at the Aberdeen Floating Village. Scenery of the Aberdeen Floating Village. Aberdeen floating village (Chinese: 香港仔水上人家) is located at the Aberdeen Harbour in the Southern District of Hong Kong. The harbor is known to contain 600 junks and is home to 6,000 people. Since the 19th century, Aberdeen emerged as one of the most important fishing ports in Hong Kong. In the past two decades, the population of the Aberbeen Floating Village community has decreased  due to rapid fisheries development in the nearby Guangdong Province and the increase in operating costs of the fishing industry in Hong Kong. Presently, the majority of the boat people use the boat to fish during the day instead of making it their permanent abode. Most of the descendants of the floating people have chosen to relocate to high-rise accommodations on dry land. Prior to the 1950s, salt fish was the major catch sold at Aberdeen. Today, Aberdeen is the only fishing port in the Southern District in Hong Kong. It continues to play an important role in the fishing industry. The catch of fish in the Aberdeen port accounts for over one-third of the total catch of fish in Hong Kong. During the Fishing Moratorium Period (June and July), more than 1,000 fishing vessels are anchored at the Aberdeen Typhoon Shelter. The people living on boats in Aberdeen are mainly Tanka, a group which arrived in Hong Kong around the 7th to 9th century. The word "Tanka" literally means egg people and was used to describe how this ethnic group paid taxes with eggs instead of money. While the term Tanka is used by the boat-dweller themselves, it is not accepted when used by someone from outside of the community for its derogatory connotation. Aside from the Tanka, there is another ethnic group in the floating village called Hoklo and these people originally came from Fujian province. The Tanka and Hoklo ethnic groups did not always get along. While sometimes referred to as "boat people", they are in fact boat dwellers and should not be confused with the unrelated Vietnamese refugees boat people, who came to Hong Kong by boat in the 1970s. The total population of boat dwellers in Hong Kong was estimated at 2,000 in 1841, 150,000 in 1963 and at 40,000 in 1982. Aberdeen's temple to Tin Hau attest to a long tradition of marine and fishing cultures and traditions in Hong Kong. Aberdeen's role as a port emerged between the 14th and 17th centuries when sandalwood (taang heung muk) arrived in junks from Lantau Island and Sha Tin. The waters of Aberdeen served as the intermediary, dispatching the sandalwood into larger boats up the East China coast to major cities in China. Aberdeen boat people are well known for their floating restaurants which serve fresh seafood caught directly from their own boats. Each floating restaurant serves different types of seafood, each with a unique Cantonese cuisine flavor. Some boat people sell fresh seafood, dried fish and salt fish on their respective boats along the coast. Dragon boat racing in Hong Kong commenced in the 1900s. The Duanwu Festival that takes place in the fifth day of the fifth month in the Lunar calendar is an event of tremendous importance to Hong Kong fishermen. Fishermen think that rowing dragon boats during the Duanwu festival will bring them luck. Each boat carries with it 48 paddlers. Aberdeen is a pioneer in hosting dragon boat races. Aberdeen hosts the Dragon Boat race each year and receives a lot of community support. A family living on a boat. Although Aberdeen has now been transformed into a semi-commercial district, it has maintained the style of a fishing village. Some of the residents actively engage in boat activities and mainly rely on the boat for daily living. Some common boat people activities include fish salt-processing, washing fish and driving, and serving as tour guides on the sightseeing sampans on the waterfront. Some boat people are employed at the boat restaurants which sell fresh seafood mainly for tourists. The chefs in the restaurants use traditional methods of cooking fresh seafood to provide tourists with a taste of Aberdeen. Some boat people drive and serve as tour guides for sightseeing sampans on the waterfront. When people are walking along the shore, the boat people would invite them for boat travel to some small islands nearby or the surrounding area for 20 to 30 minutes. The tour guide would introduce the scenic and special points of those areas to the tourists during the ride. The ride costs $50 to $80 Hong Kong dollars. At least once a day, boat people drive their boats out to the surrounding areas to catch fish. The catch is handed over to the wholesalers in the Fish Marketing Organization (F.M.O) for further wholesaling, or simply sell them directly to wet markets or seafood restaurants. There are many other people in Aberdeen who neither live nor work on boats. Most of these people consume fresh seafood from small-scale fish boats, or go to seafood restaurants to dine. There are two famous floating restaurants in Aberdeen: the Jumbo Floating Restaurant and the Tai Pak Floating Restaurant. In addition to food, non-boat people also go to the marine parks at the waterfront for leisure activities, such as doing exercise, stretching or simply chatting with their neighbors. Trawling is the most common method used by the fishermen in the South and East China seas. The type of trawling method used depends on which type of fish the fisherman intends to catch. For catching other marine animals, different methods are used. For the gill-netting operation, the fish boat would pull a long net at its back, where the fish will flow into. For the seine fishing operation, fishermen will place a rounded net into the sea when they see a school of fish swim by. The long-lining operation consists of the fish boat pulling a string, tagged with little fish, to attract and lure the fish into the string. To catch shrimp, fishermen use the shrimp trawling operation, during which they would throw small bags into the sea to catch shrimp. Shrimp trawlers are used to catch shrimp using the shrimp-trawling method. However, shrimp trawlers only account for a very small portion of trawlers in Hong Kong. Currently, the most common trawlers in Hong Kong are the Hang Trawlers, Sten Trawlers, Purse Seniers and Gill-Netters. All of these local fishing boat junks were mechanized after the Pacific War. Drying salt fish caught in the waters of Aberdeen. The fish market at the Aberdeen floating village organized by the F.M.O. The Fish Marketing Organization (F.M.O) is a self- financed, non-profit organization that provides marketing services to fishermen and fish retailers at the Aberdeen floating village. F.M.O's income derives from the commission on sales and surplus earnings. F.M.O's earnings are used to improve the facilities of the Aberdeen Floating Village. Wholesale fish markets operated by the F.M.O are located along the Aberdeen Promenade. A bowl of "Fish Ball Noodles" with fish balls, meatballs and fish spring rolls. Every morning the Aberdeen boat people catch fresh fish to make fish balls. These fish balls are used to create the local Aberdeen specialty, the 'Fish Ball Noodles'. Boat people use traditional and other unique ways of cooking the fish ball noodles. Every evening at 6, people from all over Hong Kong come and visit the village to enjoy the delicacy. Along the Aberdeen Promenade, there are multiple ferryboats and a lead-way to Ap Lei Chau, Lamma and Po Toi. There are also a series of shuttle ferries to the Jumbo Floating Restaurant and sampans for hire for sightseeing activities. Small sampans are used as a common mode of transportation between Aberdeen & Ap Lei Chau Island. The ferry service running between Lamma Island & Aberdeen is operated by Chuen Kee Ferry. 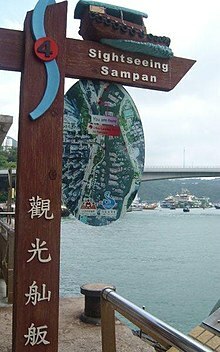 Ferry service between Aberdeen to Pak Kok Tsuen and Yung Shue Wan (Lamma Island) is operated by Tsui Wah Ferry Co.
Free of charge shuttle boat from Aberdeen Promenade or from Sham Wan pier to Jumbo Floating Restaurant. The Jumbo Floating Restaurant is one of the most prominent tourist attractions in Aberdeen. It is a double-storey boat, which serves Cantonese–style cooked seafood on board. Despite its high-quality food, the dining atmosphere is the main attraction of the restaurant. The Jumbo Floating Restaurant is filled mostly with tourists and locals who bring their overseas business clients and foreign friends for a taste of traditional Hong Kong life. Although now Aberdeen has been transformed into a semi-commercial district, it has still maintained the style of a fishing village. One should never leave Aberdeen without taking a ride on a traditional sampan to cruise around the typhoon shelter or to cross the waters to Ap Lei Chau. The sampans to Ap Lei Chau are provided with the Octopus Card (the multi-purpose store valued smart card system in Hong Kong). Sightseeing Sampan at the shore of Aberdeen side. Inside a sampan being used as public transportation between Aberdeen & Ap Lei Chau Island. Note the Octopus Card scanner in the middle. The Aberdeen Country Park is built around the reservoirs on the southern side of Hong Kong. The Aberdeen Country Park flourishes in leisure trails and attractive promenades. The longest trail can actually be completed within an hour. The Aberdeen Country Park is more than just a park; in more practical terms, the Hong Kong Tourist Association has established an information centre in the park’s southern section for the documentation of informative pamphlets, further contributing to the educational sector of the park. The Tin Hau Temple in Aberdeen was founded in 1851, and it serves the purpose of commemorating Tin Hau. Every April, the temple flourishes with ceremonies for the purpose of celebrating Tin Hau's birthday. During the ceremony, people decorate their boats on the Aberdeen shores and lion dances are performed outside the temple. ^ a b c d e f g "Development of tourism in Aberdeen." from sign at Aberdeen Floating Village, Published by: Southern District Council, Hong Kong. Date visited: October 12, 2009. ^ a b c Insight Guides (2014). Insight Guides: Hong Kong City Guide. London: Apa Publications Ltd. ISBN 9781780057989. ^ a b c "Development of the Fishing Industry in Aberdeen" from sign at Aberdeen Floating Village, Published by: Southern District Council, Hong Kong. Date visited: October 12, 2009. ^ a b Chen, Piera; Matchar (2017). Lonely Planet Pocket Hong Kong. Franklin: Lonely Planet. ISBN 9781787010482. ^ Grzeskowiak, Andrew (1996). Passport Hong Kong: Your Pocket Guide to Hong Kong Business, Customs & Etiquette. San Rafael, CA: World Trade Press. p. 25. ISBN 1885073313. ^ a b c Ingham, M. (2007). "Hong Kong, A Cultural History", New York: Oxford University Press, p.139. ^ a b c d e f g "Lifestyles of Fishermen" from sign at Aberdeen Floating Village, Published by: Southern District Council, Hong Kong. Date visited: October 12, 2009. ^ "Customs of Fishermen" from sign at Aberdeen Floating Village, Published by: Southern District Council, Hong Kong. Date visited: October 12, 2009. ^ a b c “A short guide to Aberdeen.” from sign at Aberdeen Floating Village, Published by: Southern District Council, Hong Kong. Date visited: October 12, 2009. ^ a b c d e "Fishing Methods" from sign at Aberdeen Floating Village, Published by: Southern District Council, Hong Kong. Date visited: October 12, 2009. ^ a b "Development of the Fish Marketing Organization" from sign at Aberdeen Floating Village, Published by: Southern District Council, Hong Kong. Date visited: October 12, 2009.